Time is one of the triple constraints, and possibly the most difficult to manage. 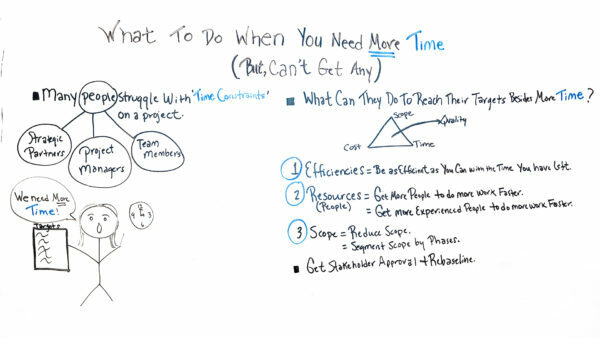 Jennifer Bridges, PMP, shows you how to deal with time limitations in a project. Jennifer opened with the fact that managing a project is controlling the triple constraint of cost, time and scope. She acknowledged that many people struggle with the time aspect. Efficiencies: One thing you can do is work towards being as efficient as possible within the timeframe allowed to complete the project. Resources: In this regard, Jennifer is speaking about people. Can you get more people to do more work faster? Maybe the answer is to find more experienced people to do more work faster. Scope: You might reduce scope or segment it into phases. Of course, if you’re going to change one or more of the drivers of a project, it must first be submitted to and approved by the stakeholder. They might want to re-baseline the project. However, the final product or service (including its quality, cost and time to completion) are all critical to the project success. Sometimes, one aspect must give to create the whole successfully. Pro-Tip: Before you get into trouble, you want to address the issue of time in the project. Time blocking is a great tool to manage your time effectively. It’s a way to schedule your entire day so as to make sure there’s time to complete everything that must be completed. Today, we’re talking about what to do when you need more time, but you can’t get any. I don’t often use the word “many,” but in this case, I am because I submit that many people struggle with time constraints on projects. That not only includes project managers, but also strategic partners as well as team members. And then there’s certain scenarios that happen where the show is gonna go on. The end date of the project is not going to change, so we have to do things to accommodate that. So, what can you do to reach, you know, your targets besides getting more time? Well, let’s look at it. In a project, there are different variables that we’re measuring and tracking. We’re tracking the cost. We’re tracking the scope, the time, and in most cases, the quality of the deliverables or products that were producing. So, if we’re working on the time variable and that can’t change, we can look at some of the others. So, we can look at efficiencies. So, even though we can’t get more time we can be as efficient as we can with the time that we have left. So, what are some things you can do with tools and templates and finding ways to improve the process? Another thing you can look at are resources, people. You can get more people to do more work faster. You can also bring in sometimes more experienced people, maybe sometimes a subject matter expert who can do more, faster as well. So, even though you bring in more resources that’s going to help with your time situation, and because you’re possibly either bringing in more people or a more experienced person, it’s probably going to impact your cost. So your cost may go up. We can also look at the scope. We can also consider reducing the scope. Within the time what are the things that we can cut out that we don’t have to produce and that will save time. We can also look at segmenting that scope by phases and get approval to maybe in this time frame complete this set of scope and set another phase or another time period to finish the other. So, these are a few things that we can look at or the variables that we can modify or change because this time one, we can’t increase. But if we change any of these variables it’s very important to get stakeholder approval and in some cases, rebaseline the project. But these are some of the things you can do and if you can’t get more time, but help with your project. And if you need a tool that can help you then sign up for our software now at ProjectManager.com.